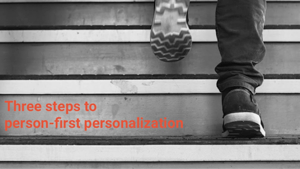 Person-first personalization is a hot topic at the moment. Forrester Research, The Relevancy Group, and other thought leaders are writing extensively on the subject. Why? Because consumers have raised their expectations. When consumers have personalized experiences with Spotify, Netflix or any other similar brand, they subsequently expect all other brands to deliver the same 'surprise and delight’ experience.